Brand Info: These jackets are under the brand name "ALL SAINTS" and are the "Bale" style. "ALL SAINTS" is a British clothing company, and these jackets were only available in Fall/Winter of 2016. 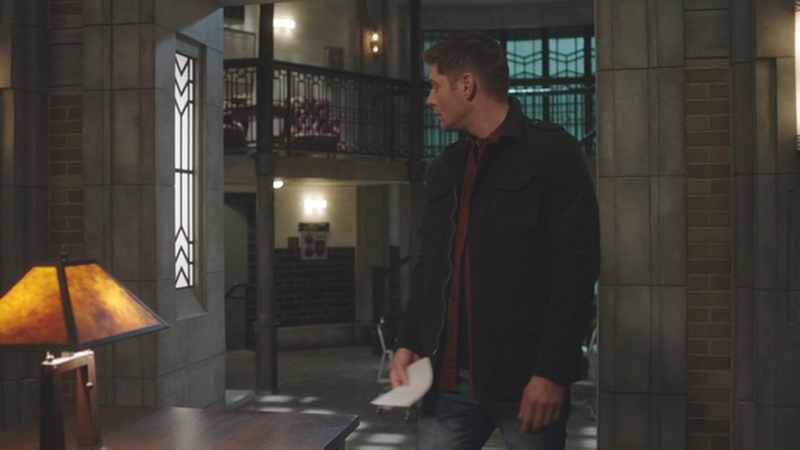 In The Raid (12x14), Dean is wearing this coat when he returns to the Bunker to find Sam gone, and then discovers that they are out of booze, and then answers the door to find Ketch wanting to hang out. He takes it off when he actually drinks with Ketch, but then puts it back on when they go out to hunt vampires – wearing it for the rest of the episode. If you are interested in buying a brand new black All Saints Dean Winchester jacket in a Medium please contact me at tylertroost@gmail.com. Also, I have other Dean Winchester jackets & shirts of his, along with Sam Winchester clothing if you’re interested. If your a big Chuck/God fan, you might like to buy his green jacket which is an X-Large. Lastly, my favorite Dean Winchester jacket that doesn’t fit me is the Gap Commander Slub Twill jacket that I have in a Large. I would be willing to trade for a Small or possibly X-Small for an Esprit (green or blue) jacket or for a Gap Commander Slub Twill in a Small or possibly an X-Small. Shout out to the creator of this site! Hell’s Half Acre thank you so much for taking your time to create an accurate clothing catalogue that’s always expanding for all of us fans. I really love your work and I was wondering if you’re continuing this project? Yup! I'm just always a year behind.